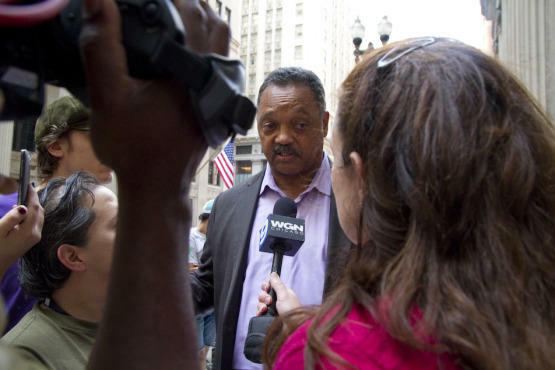 Jesse Jackson joined Occupy Chicagoprotesterson day 15 of their occupation. Occupy Chicago protesters on day 15 of their occupation. Jesse Jacksonmeets protesters from the Occupy Chicago movement on day 15 of their occupation. Jesse Jackson addresses Occupy Chicago protesters at their daily general meeting. Jesse Jackson teamed up with the Occupy Chicago protesters on Friday afternoon and marched with them to their general assembly, where he addressed the group on its success thus far. I caught up with the protesters on the return trip to the Federal Reserve and found their organizers articulate and organized if a touch romantic about the global nature of street protests these days. Today, Chicago is expecting a large march in the afternoon as Occupy Chicago teams up with Take Back Chicago. The Occupy Chicago group tweeted earlier this morning that it expected police would push it from its spot at LaSalle and Jackson, under what pretext I'm not sure. But today seems like a good opportunity to take a look at how the movement has been treated in the media in the last month. Today's headlines about Occupy Wall Street speak to its perseverance, its increasing reach and expanding message and varied reactions to it. The OWS protests are in their fourth week and have welcomed a wider tent of those concerned about the economy, labor unions among them, lending the group new legitimacy. The argument that these are lazy college dropouts in patchouli no longer holds water, but even if it did, was no excuse for not covering the protests from the get-go. But to my eye, there's been something fishy about the coverage of Occupy Wall Street from the get-go. What was revealing to me in those early weeks was the slowness of the mainstream media to cover OWS in any serious way. It was as if it had already decided OWS was a lunatic fringe that would pass before their camera's lens cap came off. On vacation when the riots ramped up in their second week, I had lots of time to scan the TV for any live coverage. Result: almost nada. As was my experience during the London riots, I quickly turned to the Internet, my Facebook friends and Twitter feed (as well as the European press) in early October to try to get a handle on what was actually going on in Wall Street because CNN, even MSNBC not to mention the other mainstream outlets were starving us for information, despite the fact that they have offices within a subway ride of the protests themselves. Was Wall Street really such a sacred golden cow? When the initial coverage came, it sometimes came with a premature, dismissive tone. Compare this with the oddly reverential treatment of the tea party, where any coverage of bizarre rants or scatological thinking tended to get edited out of mainstream coverage for palatability, and you have a media double standard. Were the tea party tax day protests larger? Yes. Were they really grass roots organization? That's debatable. Were there kooks involved? Of course. Some of the most telling editorials on OWC came from the business press. The sneering reaction to the protests sometimes smacked of privileged frat boys slamming the doors on some hippies during Greek week. "They just don't get it, you know, the Greek system, er, I mean capitalism." The NYT business page even took a skeptical tone at first. I can't imagine it was too hard to find some "kooky" quotes down in the OWS camp, but neither can I imagine that some more articulate protesters could have easily been procured. At the NYT, of course, this was balanced by a more thoughtful look at the origins of the protests. But what of the sluggishness on the part of the rest of the media in covering OWS? Here are five possible explanations for it, all of them inexcusable from a journalistic standpoint. 1. An angry, impassioned left doesn't fit into the media's usual, day-to-day, play-by-play of the GOP versus the Democratic President. 2. Creative, fun, somewhat wacky protesting clashes with the "serious" nature of politics as the media approaches it. 3. The media was analyzing the protests before it was reporting them and finding them too vague to understand. 4. Members of the media, like most full-time professionals, have investments and retirement funds, all of which they'd like to see go up, not down. Hence, a (subliminal, maybe) reverence for those at the helm of Wall Street. 5. The members of OWS didn't wear suits and ties, therefore they must not be worth reporting. This past weekend, echoing that double standard, the likes of Eric Cantor described the overwhelming peaceful protesters as a "mob" while seeming to be okay with tea party activists literally spitting on our elected members of government in Washington. Herman Cain has quite a take on the protests; he believes that the protesters are "blaming themselves" for something. What's shocking in all this is few have commented on the parallels between OWS and historic social movements. Social movements can just as often be about a group of issues that have yet to be sorted out as they can be about singular solution. For every women's suffrage movement, there's a movement around a looser collection of issues. In fact, if one compares a movement based on "no taxes" versus a movement based on "reasonable taxes and government regulation of the extremely wealthy," the naivete seems to run both ways. A protest is always a somewhat inarticulate and absurd way of expressing specific policy initiatives. On the other hand, a passionate expression of powerlessness and dissatisfaction from a group can make an impact, even if it might look strange to those working 16-hour days and pulling down six-figure bonuses. In fact, there's long been a must-read tome for academics on what poor people's social movements do work. Crazy shorthand answer: the DISORGANIZED ones! Once the elites get involved and the bureaucracy takes hold, movements tend to be subsumed into the political wallpaper, according to Frances Fox Piven. You can disagree with the OWS methods all you want, but if you don't know that there's an intellectual basis for them (and loads of other texts to cite), you're never going to understand it, much less write about it intelligently. Some thoughtful editorials have since emerged. This Washington Post editorial provides some needed context. And this NYT editorial makes a good point: Protesters don't make policy, they express themselves. But perhaps the best, most succinct explanation of what's driving the protests came from Florida's Alan Grayson on Bill Maher—which has the added advantage of making P.J. O'Rourke look like an idiot.